As battery's state of charge decreases, successive LED lights up, only one at a time. Item will be shipped from USA Local Warehouse and Estimated Time for Receiving 5-10 business days. Please contact us to resolve any issues before leaving any neutral or negative feedback. Good Communication will be more appreciated,thanks for your support in advance. US Local Fast Free Shipping & 100% Brand New & Guarantee High Quality. Fitment:for EZGO, Club Car, Yamaha Golf Carts / Yale, Toyota, Crown Forklifts / Marine Boats and so on. Material: ABS & Waterproof: IP65 & Temperature Range: -40F to 185F & Suitable for lead-Acid Battery. 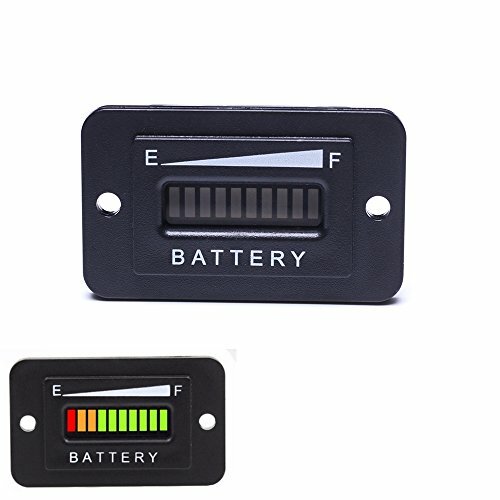 Works with 48V Lead-Acid Batteries in Golf Carts, Forklifts, Trucks, RV's, ATV's, UTV's, Scooters, Boats and More. If you have any questions about this product by Auto-Parts-Eshop, contact us by completing and submitting the form below. If you are looking for a specif part number, please include it with your message.